Residents of a Carlsbad townhouse were evacuated early Saturday morning after a pickup truck crashed through the wall of their home, injuring the driver, according to police. 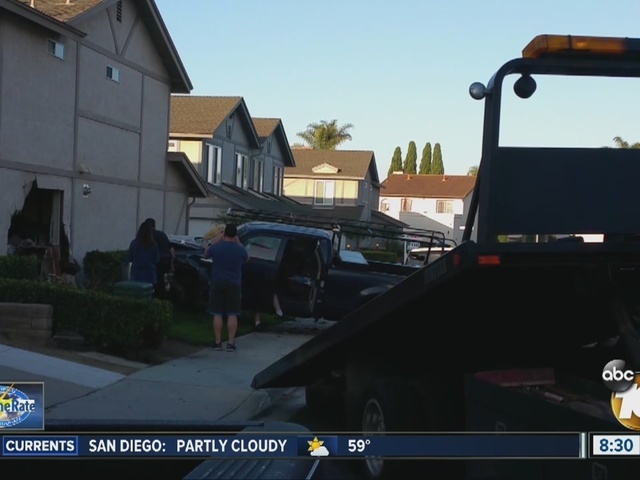 The crash happened shortly after 5:30 a.m. in the 2800 block of Unicomio Street, when a 20-year-old Carlsbad man traveling westbound in a Ford F-150 struck a parked vehicle, crashed through the wall of the townhouse and came to a stop in the family room, Carlsbad Police Sgt. Darbie Ernst said in a statement. No one in the home was injured and the driver was treated at the scene for minor injuries and released, according to Ernst. Carlsbad firefighters and a city building inspector also responded to the home. The Red Cross was contacted to help relocate the family that lives in the home. Drugs and alcohol were suspected in the crash, according to Ernst.